The water level sounder uses a shrouded probe with a unique design to prevent bridging and detect the bottom of the well. Bridging is often encountered during pump tests with similar water level sounders. All WL 500 Well Level Sounders carry a sensitivity adjustment for different water qualities. This sensitivity control prevents false readings in wells containing very pure water or very conductive water and is ideal for pump and draw down tests. When the water level sounder's probe assembly makes contact with the surface of the water, a bright LED glows and a beeper sounds on the reel. The water level sounder detects the bottom of the well using a specially engineered tip that causes the sounder's audio alarm to cease when the bottom of the well is reached. The well level sounder consists of a strong NTS-certified polyethylene jacketed measuring tape that will accurately read to 0.01 foot or 1 mm. 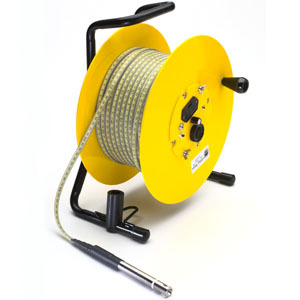 The tape reels are built of resistant polycarbonate (or, for units with over 400 ft cable, of lighter aluminum). Our clients almost universally prefer aluminum reels for the improved durability, ease of cranking, and better ergonomics. Most plastic reels have much smaller hubs and that makes cranking much tougher. All load bearing components on the WL500 well level sounders are made of aluminum. The depth sounder is battery operated, thus there is no danger of shock from an outside power supply. Two conductors make a separate ground connection unnecessary, so the instrument will function equally well in uncased test holes or in uncased wells in rock. Water entering the well from casing leaks or perforations about the water level will not affect the depth gauge's measurements.